... 1948, in Washington, D.C., testimony continued before a Special Subcommittee of the House Committee on Un-American Activities, part of "Hearings Regarding Communist Espionage in the United States Government" that had begun on August 3 and would last through the month. 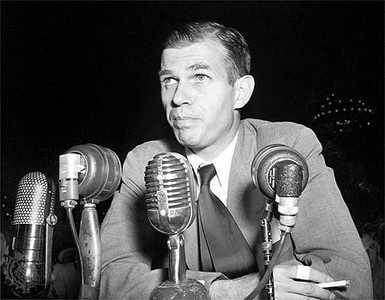 Particularly targeted in the hearings was Alger Hiss, whom a former member of the Communist Party in the United States had accused of spying for the Soviet Union. Hiss, a Harvard Law graduate, had been a law clerk to Justice Felix Frankfurter and then served as Director of the Office of Special Political Affairs at the U.S. Department of State – a position that gave him leading roles in the Yalta conference during World War II and in the Dumbarton Oaks and San Francisco conferences at which the U.N. Charter was adopted. On this day, in execution session, Hiss was examined by Richard M. Nixon, then a member of Congress and of the Special Subcommittee. Hiss denied knowing his accuser, before, during, and after this testimony. (credit for undated photo of Hiss at hearings) He would be convicted of perjury in subsequent criminal proceedings, and would serve a number of years in federal prison.